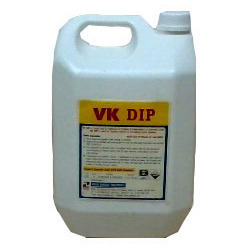 VK® DIP SOFT Fumeless Stainless Steel Picking Liquid. Stainless steel pickling is the most common pickling process used at SLChem facility. We take this opportunity to introduce you a unique chemical technology for stainless steel PICKLING AND PASSIVATION. This technology, the only of its kind has excelled in the INTERNATIONAL MARKETS as well as INDIAN MARKETS. We have the entire range of processing solutions for stainless steel of all types & grades including Duplex alloys. We are also into Stainless Steel Pickling Services. For furnishing these services, we employ leading-edge techniques and contemporary equipment. These services are widely appreciated by our clients for their timely execution, and high efficiency. 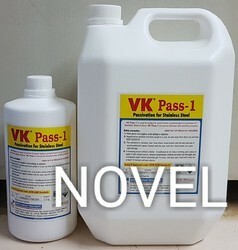 - Fast action, non-fuming easy to use, stainless steel picking chemicals - Gel, Spray & Dip Grades. - Available full range – Gel, Dip & Spray grades, as well as pre-cleaning & passivation products. - User friendly. Minimum fuming & skin irritation. - Do not contain chlorides or sulfuric acid. BQB Infra Technorium Pvt. Ltd.